One of several judges sits through a virtual hike of Yosemite National Park's "4 Mile Trail" demonstrated by Miranda Taylor, the developer and creator of Adventures VR, the first place winner for the virtual reality (VR) section of the VARJAM competition. Photo by David J. Hawkins. Students, faculty and staff across California State University, Northridge are taking part in a host of trailblazing programs, initiatives and competitions. From cutting-edge research labs to technology integrated across the curriculum, innovation permeates the campus, and CSUN officials are expanding and enhancing those initiatives to further infuse innovation throughout the university in 2018 and beyond. In recent years, competitions such as the annual CSUN Bull Ring and Fast Pitch New Venture Competitions have taken root, giving CSUN student entrepreneurs the opportunity to receive feedback from established professionals and mentors. CSUN President Dianne F. Harrison has praised pioneering students including those who have developed applications to improve accessibility and quality of life for people with disabilities, as part of technology and entrepreneurship competitions. In the university’s second annual Fast Pitch competition, undergraduates Edgar Limon, Arvin Flores and Jasmine Beeman developed “smart script” internet code to help people with visual impairments better navigate websites. The university also hosts annual student “Jam” competitions where undergraduate and graduate students compete to create the best mobile app (AppJam), produce virtual and augmented reality projects (VARJAM), and manipulate, analyze and visualize data (DataJam). The Bull Ring is CSUN’s own version of Shark Tank, hosted by CSUN’s David Nazarian College of Business and Economics. The Bull Ring serves as a launch pad for new ventures from CSUN students, while providing access and exposure to mentors, coaching and potential investors. The event was made possible through a gift from CSUN alumnus Jeff Marine and his family. Winners receive a grand prize of $20,000, $10,000 for second place and $5,000 for third place. In the Fast Pitch competition, sponsored by the Nazarian College, participants compete for $4,000 to fund their business ideas. The student teams are evaluated and awarded first, second and third place — receiving $2,000, $1,000 and $500, respectively. Attendees also crown an “Audience Choice” winner, who receives $500. In April, CSUN students and faculty came together for the first time to experience the world of virtual reality (VR) and augmented reality (AR) at the Information Technology-sponsored VARJAM competition. During VARJAM, the 10 competing student teams demonstrated the VR and AR projects they had been working on since early March to fellow CSUN students, faculty and judges from various VR companies within the technology industry. Student Miranda Taylor took first place for her “Adventure VR” program that helps those with mobility challenges experience nature by bringing it to them. 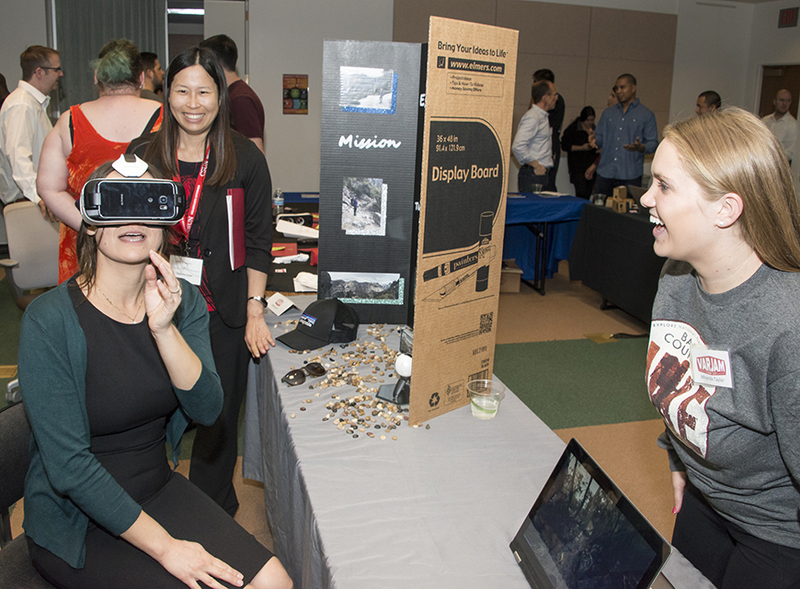 “It was great to see CSUN students consider such innovative and real-world applications for the use of virtual and augmented reality,” said Hilary J. Baker, CSUN vice president for information technology and chief information officer. The winning teams were selected based on the judges’ evaluations of the students’ creativity and innovation, the effective use of VR and AR technology and the multimedia presentation’s quality. The university is planning to launch CSUN’s first AI (Artificial Intelligence)-JAM in spring 2018. These efforts reflect the university’s responsibility to be innovative, inspire innovation and stimulate economic prosperity, officials said, for Los Angeles (the nation’s second-most populous city) and Los Angeles County (the nation’s most densely populated county, and one of the world’s largest economies). While many students are drawn to competition, others draw inspiration from the mentoring, technology and resources that are provided in and out of the classroom. CSUN is planning a new maker space, which officials called the CSUN Creation Hub, potentially for the Delmar T. Oviatt Library. Equipped with tools to help innovators design, make and present prototypes and models — as well as space to work, meet and collaborate — this planned facility will be a hub of innovation and ideas. This past fall, CSUN also launched its new entrepreneurial program, Innovation Corps (I-Corps) Site Program, which helps students undertake the challenge of customer discovery — a process that incorporates customers early in a business development process. In support of promoting science, technology, engineering and mathematics (STEM) at CSUN, in March 2017 the National Science Foundation (NSF) awarded the university’s I-Corps Site Program a $500,000 grant over the next five years. The grant will provide up to 30 teams with $3,000 each to explore an idea, product or service in the STEM fields. The teams consist of an entrepreneurial lead, typically a student or postdoctoral fellow; an academic lead, typically a staff or faculty member; and an industry mentor, who can be a non-CSUN affiliate. Officials said they expect the I-Corps program to improve the teams’ innovative start-up companies. The Nazarian College has been at the forefront of entrepreneurship and innovation, with programs such as LACI@CSUN, a partnership with the Los Angeles Cleantech Incubator, an on-campus incubator that promotes innovation and entrepreneurship, and myriad CSUN student competitions such as Fast Pitch and the Bull Ring. These newer developments complement existing programs such as the Wells Fargo Center for Small Business and Entrepreneurship and the Ernie Schaeffer Center for Innovation and Entrepreneurship in CSUN’s College of Engineering and Computer Science. These programs led Bixel Exchange to rank CSUN one of the top schools producing tech talent in the Los Angeles area. In its inaugural ranking in mid-November, Bixel’s Sector Report on the IT Industry named CSUN No. 2 for bachelor’s degrees and No. 3 for master’s degrees. Bixel Exchange is a center for innovation and technology based at the Los Angeles Area Chamber of Commerce and the Los Angeles Small Business Development Center. The organization seeks to support startups and helps connect entrepreneurs and students with investors. Recent graduate Rafael Muñoz ’17 (Computer Information Technology) agreed. Through his work in CSUN’s Layer 8 Computer Security Club (and his work as a student employee in the Information Technology division), Muñoz enhanced his skills in cybersecurity and landed a job as a security assessment engineer at Technicolor, the Burbank-based entertainment and media company, after graduation. Muñoz took advantage of the innovative resources CSUN offered, he said, and he recommends future Matadors do the same. “CSUN didn’t only help me get my degree, it also helped me to move forward, network and participate in conferences and events,” he said. For more information on the New Venture Competitions, visit the Bull Ring and Fast Pitch websites. For more information on CSUN’s I-Corps program, please email research@csun.edu. Learn more on DataJam. Check out all the VARJAM competition submissions by students on Portfolium.